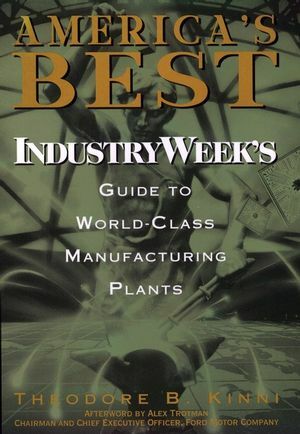 In 1990, IndustryWeek magazine established a prestigious new competition, the America's Best Plants Award, designed to recognize and honor the top manufacturing operations in the nation. To date, sixty-two companies—from such well-known names as Hewlett-Packard, Sony Electronics, Steelcase, and Xerox to smaller companies such as Zytec, John Crane Belfab, and Lord Corporation—have earned the illustrious designation of being one of America's Best Plants. Now these award-winning plants are profiled in America's Best, a unique reference that takes an in-depth look at leading-edge manufacturing practices. Detailing the individual components of world-class manufacturing, while providing personal experience from the field, America's Best offers practical guidelines that will help managers make strategic decisions regarding their own organizations. The book begins with the nine essential components of world-class manufacturing, their individual make-up, and how they interact with each other. These components—customer focus, quality, agility, employee involvement, strong supplier relations, technology, new product development, green manufacturing, community involvement—come together to create the basis of manufacturing excellence and will serve as a road map for improving your organization, your products, and your people. Profiles of each of the 62 Best Plant winners celebrate individual excellence in the field. Highlighting these profiles are on-site visit reports by IndustryWeek editors; detailed coverage of the many unique programs, tools, and techniques currently in use at each plant; and a listing of contact information for individual plants. Also included is a complete set of the winners' statistical measurements for use in benchmarking your own organization, as well as an assessment survey to help you determine how your plant measures up against the best. Filled with helpful data, advice, "lessons," and firsthand stories from Best Plant leaders and employees, America's Best will be essential reading for managers in executive suites to the shop floor who are charged with the success of their manufacturing organization. Ford Electronics & Refrigeration Corp.
GE Fanuc Automation NA, Inc.
THEODORE KINNI is the Director of Books for IndustryWeek magazine and the founder of The Business Reader, a company marketing books directly to businesspeople and corporations internationally. He is also a contributing editor to Quality Digest. MANUFACTURING EXCELLENCE: THE LESSONS OF AMERICA'S BEST. Environmental Responsibility and Employee Safety.